Growing the game means not only expanding the enjoyment that only golf can provide, it also means a more secure and healthy industry that provides jobs and allows people to grow in their careers. Troon recognizes an opportunity to grow the game by creatively introducing golf’s many benefits to a diverse range of future players. Included in these benefits is the advantage of a healthy and fit lifestyle. Improved personal fitness is enjoyed through active experiences on the golf course and also embraced at many of Troon’s private country clubs through tennis, swimming and health club programs. Through several partnerships and initiatives, Troon aims to afford a greater number of people the fortune and advantages of experiencing the game of golf and to further strengthen the industry as a result. Troon Family Golf – This player development initiative allows families to enjoy the game together with complimentary golf for juniors, along with rental clubs and instruction at more than 90 participating facilities worldwide. 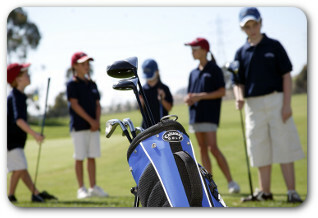 Troon Junior Club – This initiative builds upon the success of the popular Troon Family Golf program by creating a membership-based club that provides even greater access to Troon facilities for junior golfers. Currently available at Troon facilities across the country, Troon Junior Club offers preferred golf rates as well as complimentary or reduced practice fees, fun instructional programs and exclusive junior-centric events. Troon’s Player Development Month - In conjunction with the PGA of America's Get Golf Ready program, Troon facilities throughout the United States host introductory golf clinics during the month of May specifically designed to introduce juniors and beginners to the game in a fun, affordable and educational way. Get Golf Ready/Play Golf America – Troon has taken a sponsorship position with both initiatives by pledging support from all U.S. facilities. The First Tee – Troon has taken a sponsorship position with this initiative with donations and by pledging support from Troon Corporate as well as all U.S. facilities. Ak-Chin Southern Dunes Golf Club has completed a hybrid conversion of its practice facility, which now serves as a six-hole short course in the afternoon called #miniDunes and a traditional driving range during peak times of the day. The changes at Ak-Chin Southern Dunes make a major statement in the industry by taking action to make the golf experience more enjoyable for a broader range of golfers and creating an environment suited for juniors and players who are new to the game. Troon North Golf Club has created an executive 9-hole golf course called Monument Express. The course measures to more than 1,500 yards and offers two different PAR options based on each player’s experience and ability. The course can be played quickly due to its length and can be played for a very affordable price. It’s great exercise and perfect for beginners, juniors and golfers of all skill levels.